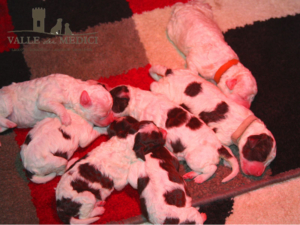 The first bath to the puppy of Lagotto should be done prophylactic vaccination ended. Sometimes it is not possible to wait until four months and we will start with some short washing of legs. With the beautiful season and with some attention you can anticipate the first washing of the puppy. There is no rush in washing the puppy, but sometimes it can become necessary for too much dirty on the pup. The puppy must be dried deeply and with the Lagotto Romagnolo is never too easy. The undercoat and the woolly hedgehog stay damp and besides the towels we will have to introduce the hairdryer. Experience often not welcome to the puppy. Let’s also remember to well dry the ears. Obviously without hairdryer. We will not have to exceed with the use of shampoo even if it is specific for dogs..
How often should the dog be washed, the Lagotto Romagnolo. Dogs should not be washed with too frequency. The use of shampoo suitable for dogs, removes from the mantle the natural fat that is the defense of the hair and skin. The fat takes several days to recreate the right balance on the skin and on the hair. Too frequent baths may be the cause of dermatitis. To avoid unnecessary baths we will have to devote us to combing and grooming of the lagotto. Sometimes, back from a walk the Lagotto is filled with pellets of grass, its can be removed manually. 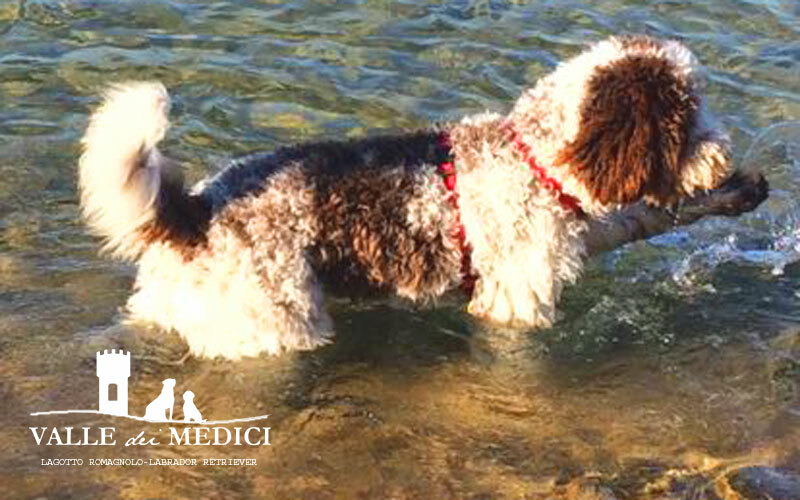 If it is an activity that we do frequently we will evaluate a short coat for our Lagotto that avoids this annoying inconvenience for both. the owner and the dog. Often a nice combed or the use of a moistened sponge is sufficient. Even wipes or dry shampoo can help to remove any unpleasant odors. The brush should rarely be used, to avoid the typical hedgehog of the breed would be smoothed hair. The main grooming of the Lagotto Romagnolo mantle is done with the use of the comb. With wider teeth to dissolve the knots and the felted hair. The typical areas where the hair is knotted resulting felting are behind the ears, between the tail and the trunk. With tighter teeth to restore tone and cleanliness. A regular combing, not too frequent is often enough to keep the dog clean and tidy. The combing action helps to distribute the natural fat along the whole mantle which will give more gloss and softness to the hedgehog. The Lagotto Romagnolo does not make a wetsuit and with the combing we will remove much of the dead hair which of course is stranded in the thick and woolly clam of the lagotto. These operations have an invigorating and pleasing effect for the dog. For the Lagotto the final effect may not always be so pleasant. It depends on the delicacy and frequency with which we comb it. The fact that the comb can not slide well through the hedgehog can create some discomfort. How to bathe, practical advice. Before bathing it is important to comb the dog thoroughly. In addition to having greater hygiene, the products that we are going to use will act more effectively, giving to the mantle of the Lagotto a beautiful curly hair soft and shiny. After washing with the shampoo we’re going to use a dog conditioner. For the Lagotto Romagnolo, the use of a conditioner is decisive for the final result. We will let the conditioner act well before proceeding to the last rinse. A nice wipe with a towel and we’ll pass the phono. Not to tire and heat up our dog every now and then we stop and will be the opportunity to pass the comb with fine teeth in the wet hair. The effect at the end will be astounding. The phone should never be pointed at the dog’s nose. If we feel like it and we will be glad we can also give a break to some longer tub or try to give a general fart grooming. A finish to reform the ride around the ears and a lowering to the neck never fails. Quiet! We won’t do any big damage! The fur of the lagotto always grows and soon some inexperience error will no longer be evident! 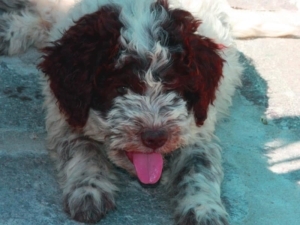 Lagotto Romagnolo a breed still to be discovered Welcome a puppy of Lagotto. When is the best time?